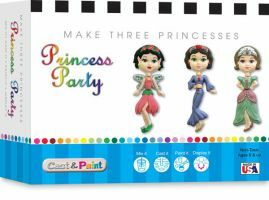 The Princess casting kits from Cast & Paint let you make your own beautiful princess models, then paint them any way you like, for a set of fairy-tale toys you can either play with or put on display - you can even put them on the refrigerator with the included magnets! Each project takes 1-2 hours to complete; and they make a great parent-child activity, too! The Princess Party Kit lets you make your own mix-and-match princesses exactly the way you want them!